In the manufacture of glass bottles great difficulty has been experienced in holding the bottles in a proper manner for finishing the necks. The common mode heretofore employed has been to use a straight bar or rod of iron with a head or ball upon one end, to which, when it is dipped into the melted glass, a quantity of glass adheres. While in a semi-fluid or plastic state, and while the bottle is also in a plastic state, immediately after being withdrawn from the mold, the glass upon the rod or punty is brought in contact with the base or bottom of the bottle and immediately it adheres thereto, and the glass soon chilled, the bottle is made fast to the punty, so that the operator may finish the neck of the bottle in any desired form. It will be recollected that during the process of uniting the punty to the bottle the bottle is in a plastic or flexible state in consequence of the heat it still retains after having been withdrawn from the mold, thus rendering it liable to get out of shape. Another objection to the old method is that when the bottle is completed the portion of the glass adhering or connecting the bottle to the punty is broken by a sudden jar by the operator, which leaves a rough place on the bottom of the bottle. By our invention we obviate all the difficulty attending the old method for finishing the necks of bottles. General Dating Notes: Pontil rods and the resultant pontil scars go back to antiquity, having been used for bottle making as early as Roman times (McKearin 1941). 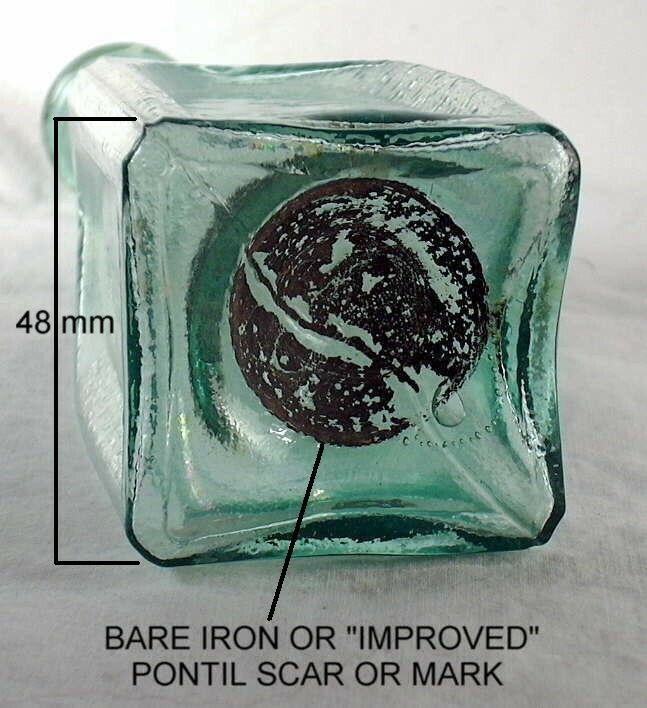 All of the different pontil scars noted below are usually (but not exclusively) found on American made utilitarian bottles that date to or before the American Civil War (mid-1860s or earlier). 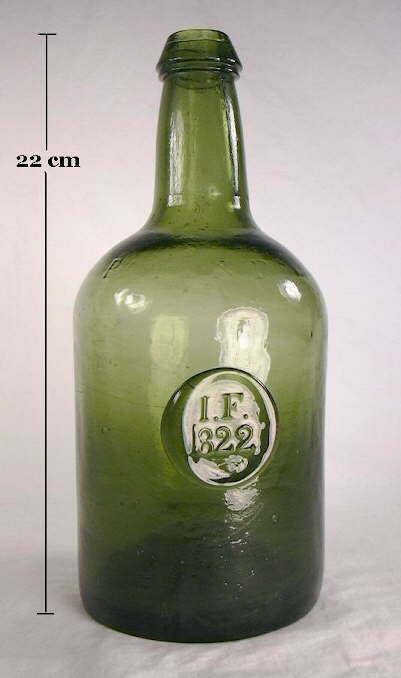 Pontil scars on all types of "utilitarian bottles" (discussed below) became ever increasingly unusual as the 1860s progressed and largely disappeared by the late 1860s or early 1870s as various "snap" or snap case tools dominated the task of grasping the hot bottle for finishing (click on the previous link to view the discussion on the main Bottle Bases page). For example, this author in 2015 inspected examples of a large majority of the bottle types recovered from the S. S. Bertrand, which sank in the Missouri River on the present day DeSoto National Wildlife Refuge (IA.) in April 1865, observing that a large majority of the bottles were not pontil scarred. In addition, the bottles from the S. S. Republic, which sunk off the eastern U. S. coast later in 1865, also showed that a large majority of the bottles were not pontil scared (Gerth pers. comm. 2010). However, the transition time for conversion from the pontil rod to the snap case was lengthy for utilitarian bottles. The first use of the snap tool in the United States may have been in the late 1840s (in Europe possibly as early as the 1830s) though its use was definitely evident by at least the early to mid 1850s. Thus, utilitarian bottles without a pontil scar can date as early as the early 1850s (rarely earlier) and pontil scars can be found - though very infrequently - on utilitarian bottles made in the late 1860s and even early 1870s (Toulouse 1968; Newman 1970; Munsey 1970; Watson & Skrill 1971; Innes 1976; Jones 1986; Jones & Sullivan 1989; McDougall 1990; Pastron & Hattori 1990; Van den Bossche 2001; empirical observations). Supporting the above estimates is one study of medicinal bottles which determined that the peak of transition from pontil rods to snap case tools was during the period from about 1853 to 1856 with utilitarian bottles made during or prior to 1845-1850 having less than a 10% chance of not having a pontil scar. Similarly, this study determined that there was about a 10 to 20% chance of a pontil scarred bottle being made between 1860 and 1865 and a rapidly diminishing (as time goes on) <5-10% chance of a bottle with a pontil mark being made after 1865. By 1870, the likelihood of any given utilitarian bottle being pontil scarred was no more than 5% and by 1875 it was essentially zero (Baldwin 1973; Boow 1991). Although this study was oriented towards medicine bottles, it is largely applicable to most or all types of utilitarian bottles (McDougall 1990). There were also regional glass maker differences for this transition period also. Farnsworth & Walthall (2011) found in their monumental study of Illinois bottles produced between 1840 to 1880, that bottles made by East Coast glass houses were smooth based beginning about 1856, whereas bottles produced in and around Pittsburgh, PA. ("Midwestern" glass houses) did not produce smooth base bottles (i.e., used snap case tools) until about 1860. 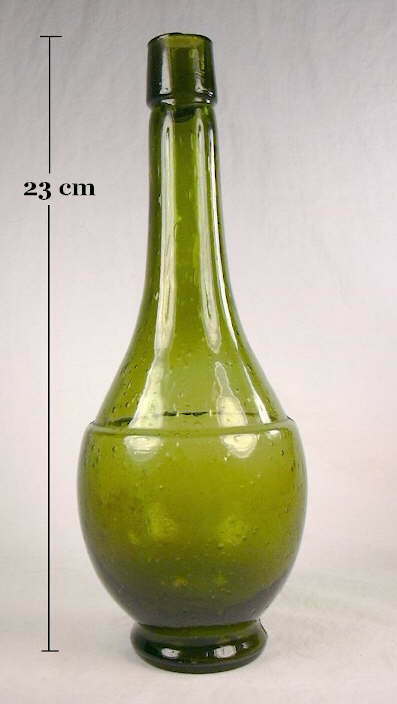 Certainly there were differences between individual glass companies in both of these large glass making regions, but the noted trend was supported by their exhaustive research of hundreds of bottles and the companies that used them. 1. 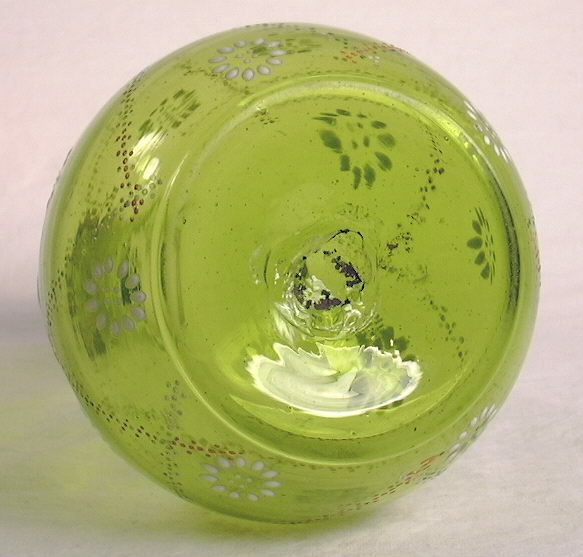 Certain classes of "specialty" bottles were made using glassmaking techniques from earlier times. Of particular note is the use of pontil rods to produce bottles through the last half of the 19th and early 20th centuries that were usually intended to be kept indefinitely. These bottles will have the presence of pontil scars well after they virtually disappeared from utilitarian bottles. "Specialty" bottles include items in the following categories: barber bottles (many of which are art glass in a bottle shape), upscale perfume & cologne bottles, fire grenades, large display or promotional versions of regular sized bottles, demijohns & carboys, druggist "shop furniture", fancy or figural wine and liquor bottles, liquor decanters and related bar bottles, and reproductions of earlier bottles. (The image to the left is of a late 19th to early 20th century turn-mold barber bottle that has a distinct blowpipe pontil scar with some residual iron, i.e., like a "combination" pontil .) Many specialty bottles were imported from Europe, though that fact may be hard to ascertain. However, many specialty bottles, most notably liquor decanters, had the pontil scars ground away leaving a shallow depression where the scar used to be (Munsey 1970). Some call this a "ground pontil" mark. Pontil rods were (and may still be) used up until recent times at Mexican decorative glass factories and by small scale art glass producers in the U.S. (Kendrick 1968). 2. Some early 19th century bottles - particularly decorative bottles intended to be kept indefinitely - were often fire polished as the final step in the production process. Fire polishing was reported to have been developed by the English in 1834, though some American flasks from an earlier period appear to have been fire polished. Fire polishing was done to remove tool and mold marks and to achieve an esthetic shiny surface to the glass much like later turn-mold bottles achieved through a different process (Ketcham 1975; Toulouse 1969). Fire polishing would sometimes remove most or all evidence of the pontil scar making a very early bottle appear to be a later smooth base bottle. To view a picture of an early American flask that appears to have been fire polished click sunburst flask. This flask, classified as GVIII-2 by McKearin & Wilson (1978), was produced in Keene, NH. and dates between 1815 and 1817. Though likely fire polished, this bottle still has the pontil scar in evidence. 3. 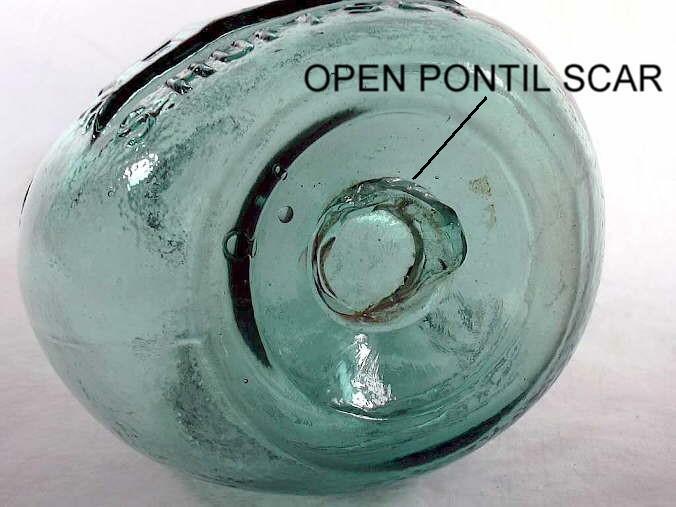 Occasionally, it appears that when the pontil rod was removed from the base of a bottle little or no glass and/or iron residue was left behind to indicate that a pontil rod was used. The reasons this occurs are unknown but may just be chance or certain glass making related conditions. These bottles would then appear to have been produced with a snap case tool when in fact they were made with a pontil rod. This likely happened with any of the empontilling methods discussed below but in particular is thought most likely with the sand pontil, glass tipped pontil, and bare iron pontil since examples of all have been noted that were very obscure and difficult to see (empirical observations). For example, in the bare iron pontil section below is pictured an early 1850s mineral water bottle with an iron pontil that visually appears to be just a worn circular area in the middle of the base. Very little iron was left behind though this example does have some pontil rod induced "ridging" that indicates its use. The point here is that close scrutiny is often necessary to conclude that a pontil rod was not used in the manufacture of what appears to otherwise be a very early bottle. The rest of this section is an overview of the main types of pontil scars: glass tipped pontil scar, blowpipe pontil scar, sand pontil scar, and bare iron pontil scar. Each section includes information on the processes that produced the scar, alternative naming, and pictured examples. Some bottles exhibit what appears to be two types of pontil scars at once; these are covered in the combination pontil section. One other type of uncommon pontil scar/mark has been identified in the literature - the disc pontil. Although uncommon on American manufactured bottles - it is found primarily on 18th and early 19th century English and Continental bottles - it is covered along with the sand pontil scar below due to strong similarities between the two (Van den Bossche 2001). Most of the information for this section is taken from three excellent past works on the subject: Julian Toulouse's Empontilling: A History (1968), Glass Bottle Push-ups and Pontil Marks by Olive Jones (1971), and Cylindrical English Wine & Beer Bottles 1735-1850 also by Olive Jones (1986). Consult these works for more information, though in particular Toulouse (1968: 204-205) and Jones (1986: 102-106) have the best overviews on the transition period from pontil rod to snap case. The illustration to the left (click to enlarge) shows the general formation method for 3 of the 4 primary empontilling methods covered in this section. Two views of each method are shown - looking straight on from the side of the bottle (right) and from an oblique angle showing the base (left). The sand pontil is not illustrated but could be considered a "hybrid" between the glass tipped and bare iron pontils except that the empontilling glass on the rod tip was dipped in sand or glass chips. See the descriptions below for specific information on all four of the primary pontil formation processes. This type pontil scar was formed by the use of a solid iron bar as the pontil rod. 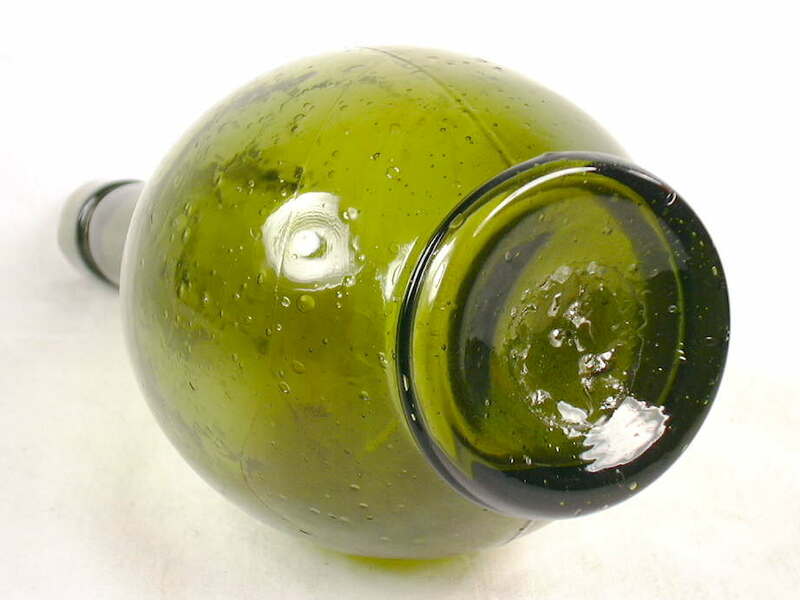 One slightly widened end of the bar was tipped with molten glass then applied and fused to the base of the bottle. A glass tipped pontil rod made contact with most or all of the bottle base within the confines of the diameter of the pontil rod tip. Click HERE to view an illustration of a glass tipped pontil in action. When the rod was broken free of the bottle, a generally round but fragmented scar was left behind on the base of the bottle. This is usually manifested primarily by an assortment of glass fragments protruding above the base of the bottle. In addition, the rod would usually take with it some small glass fragments from the base of the bottle leaving a scar which is a round scattering of "bumps and gouges" without a distinctly unmarred center - like the blowpipe pontil scar described below. Click on the picture to the right to see an enlarged version of a typical glass-tipped pontil scar that shows the detail better. (Click HERE to view a picture of the entire bottle.) The glass tipped pontil scars are usually about the same diameter of the orifice or upper neck of the bottle - like the blowpipe pontil scar which is discussed next - but for reasons unknown (unlike the blowpipe pontil scar which is explained next). 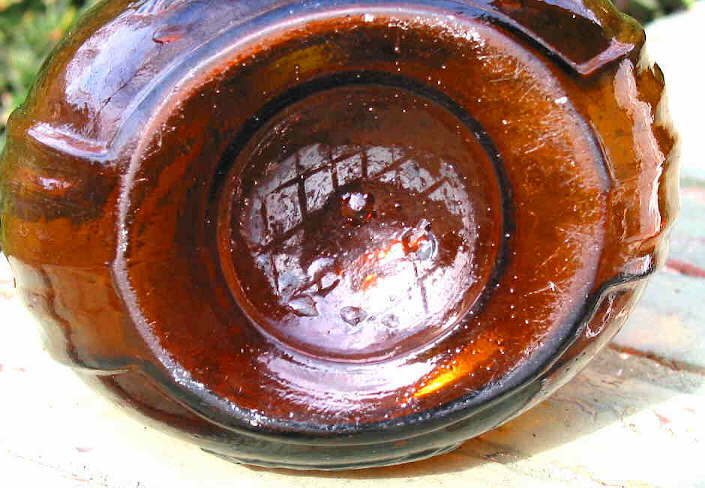 Glass tipped pontil scars can be found on a virtually any type of bottle made during the first half of the 19th century (and before). The glass tipped and blowpipe pontil scars (below) are commonly referred to by many as an open pontil. In reference to this term, Toulouse (1968) noted, "What is "open" about it and, pray tell, what would be a "closed" pontil?" Be that as it may, the term open pontil has such wide usage that it will likely always continue to be a commonly used term with collectors and many archaeologists. 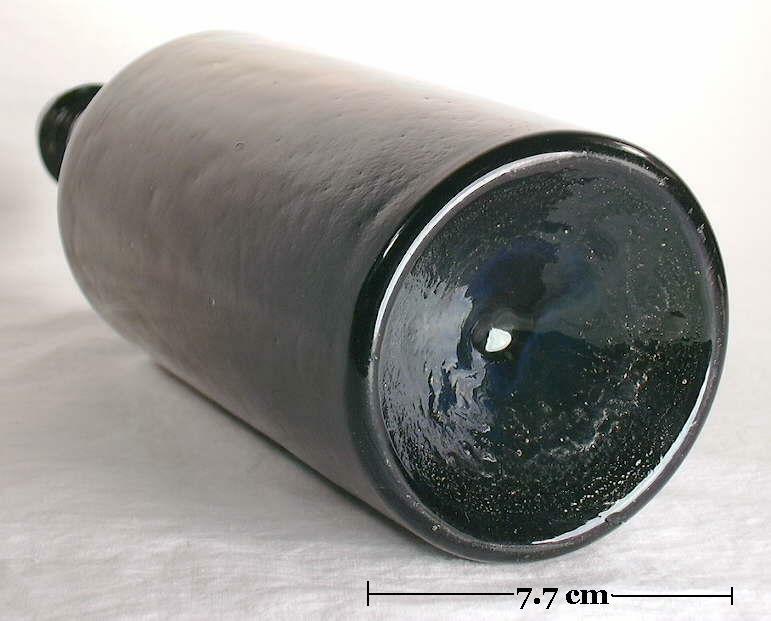 The likely commonest method was that the blown bottle was laid on a V-shaped table or structure, the blowpipe removed (cracked-off, burst-off or sheared) from the bottle neck, the remaining glass ("moyle") around the end of the same blowpipe reheated (if necessary, though likely as glass solidifies quickly) and then quickly reattached to the bottle base. 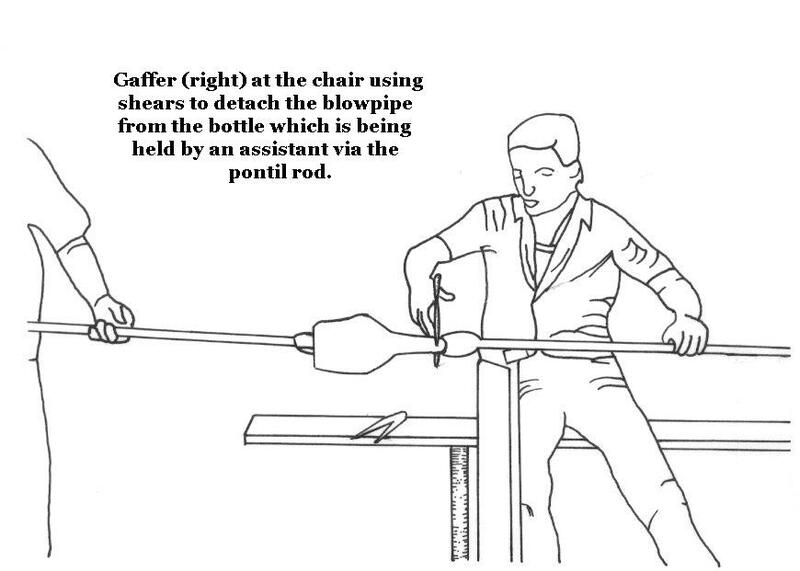 This process could have been done by one master glassblower ("gaffer") saving the labor cost of a worker to hold the pontil rod (Toulouse 1968; Jones 1971; Boow 1991). The other possible method would have been the use of a second blowpipe (glass blowers usually had several at hand) which was dipped into the glass pot by the assistant ("gatherer"), an appropriate amount of glass gathered around the sides of the blowpipe orifice leaving the orifice open, and then attached to the base of the bottle. 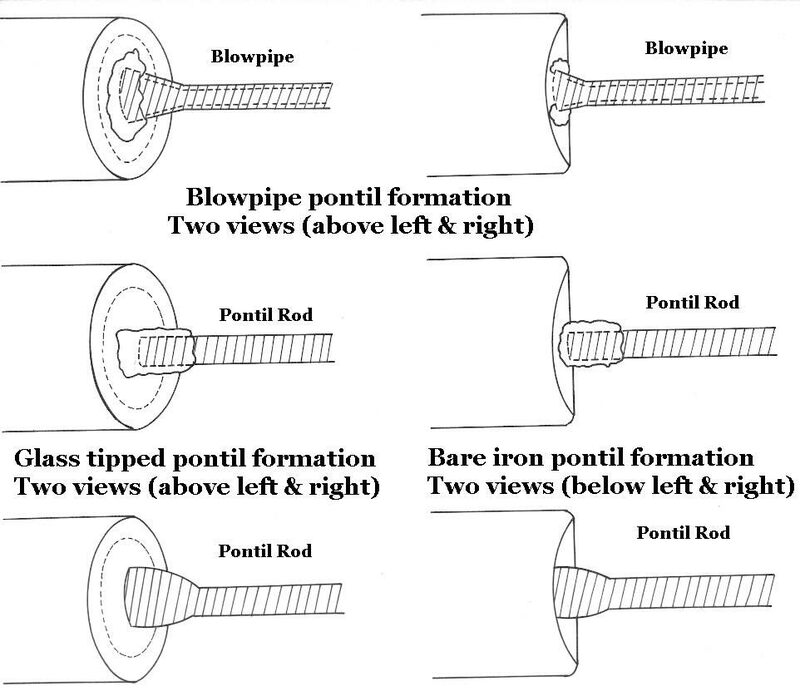 It is unknown at this point how common either method would have been, though the second blowpipe method would not have provided any labor saving over the use of the solid iron pontil rod noted earlier and was likely not as common as the "same blowpipe" method. The picture to the above right shows a very distinct, protruding, and sharp blowpipe pontil on a calabash shaped flask that was made by a New Jersey glassworks for Samuel Huffsey, a Philadelphian merchant in the early to mid-1850s (McKearin & Wilson 1978). Click HERE to view a picture of this entire bottle. Like the glass tipped pontil mark, the blowpipe pontil is found on a wide array of bottles that typically date no later than the Civil War and is even more commonly referred to as an open pontil. In fact, it is referred to as an open pontil more often than blowpipe pontil in the collector and possibly archaeology worlds. It is also called a tubular pontil (White 1978) Another blowpipe pontil scar on an early American flask (ca. 1820s to 1830s) is pictured with the General Dating Notes near the top of this page. The term "open pontil" apparently came from the early dishware industry and refers to a large (5" in diameter) circular pontil scar found on heavy dishware items like large bowls and platters, not bottles (Cannon 1990). That the scar itself be ring shaped, or approximately so. That the continuing surface within the ring be the same as the bottom of the bottle. That the enclosed surface exhibit the same surface characteristics as the surface outside the ring of the pontil scar. That a cross-bottom mold parting line, if present, continue inside the ring as without it. That when the scar is a ring of glass adhered to the bottom, the contact point will be as "square" on the inside junction as on the outside junction. Click the small picture to the left to view a larger version showing most of the above features on the base of an pint figured flask likely made at the Granite Glass Works, Stoddard, NH. between 1846 and 1860 (McKearin & Wilson 1978). Specifically, the pictured base shows the ring shape to the pontil scar, the continuity of the base surface inside and outside of the ring, and the the base mold line distinctly continuing inside the ring, Click Stoddard double eagle flask to view the entire bottle which shows that the diameter of the neck is approximately that of the blowpipe pontil scar. The calabash bottle pictured above shows Toulouse's last point which is essentially that the inside and outside surfaces of the pontil "ring" be roughly perpendicular to the base surface (or does if one is looking at the actual bottle). 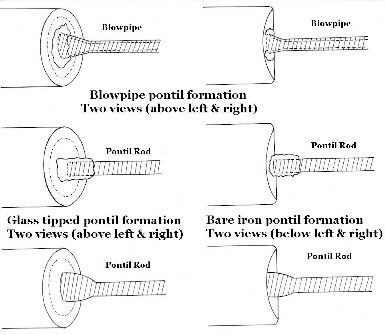 *Note: It should be pointed out that the similarity in diameter between a blowpipe pontil scar and upper neck/bore size does not hold with wider bore/mouth bottles like canning jars (empirical observations). This is most likely because blowpipes were not (and really could not be) several inches diameter, though the bore of a wide mouth canning jar is typically that wide. Blowpipes were typically less than an inch inside diameter; otherwise the pipe would be too heavy and difficult to handle, or more importantly, not properly blow, i.e. too much space in the pipe gives too little pressure for blowing (Kulasiewicz 1974). For an example of this difference in bore/pontil size click on the following links which show a mid-19th century dip-molded utility or storage jar which has a blowpipe pontil scar that is just a fraction of the diameter of the neck: dip-molded jar (the approx. 2.3" diameter mouth/neck can be compared with the faintly visible and much smaller pontil scar on the base); close-up of the blowpipe pontil scar which classic in form for this style but just under one inch in diameter. 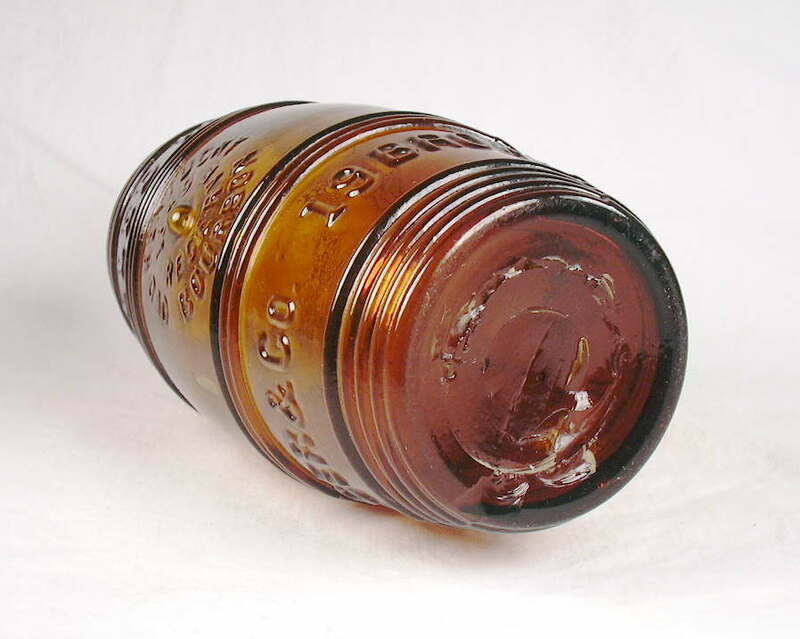 The sand pontil scar was also a common method of empontilling a bottle to hold it for finishing, though much less commonly encountered on American manufactured bottles than the other three primary methods described on this page. This mark was formed when the hot glass gather on the flared or ball shaped tip of an iron pontil rod was slightly cooled then dipped in sand (or small glass chips) prior to application to the bottle base (Van den Bossche 2001). The sand/glass chips were apparently intended to keep the pontil rod from adhering too closely to the bottle, facilitating easier removal. A larger connecting surface at the end of the pontil rod was necessary with this method in order to ensure an adequate adherence to the bottle base and was of particular use with the ever increasing numbers of molded bottles during the first half of the 19th century (Jones 1971). The sand pontil will usually (though lightly) cover a much larger diameter area on the base than affected by the other three empontilling methods covered here (although iron pontil marks can be wide also; see the next section). The sand pontil apparently conformed better than other pontil types to molded base shapes without distorting it too much (Jones 1971; McDougall 1990). 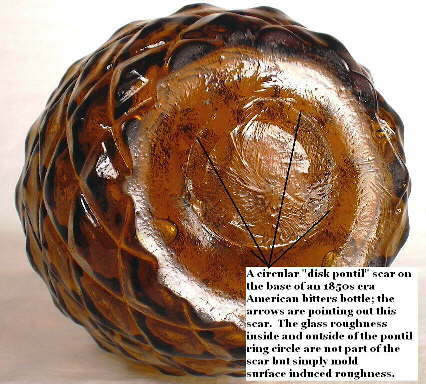 The base of a sand pontiled bottle will, however, often show some minor distortion made by the hot glass covered pontil rod head application to the bottle base which often more or less outlines the sand pontil area (empirical observations). The image to the right shows the distortion made by the pontil ball head which very slightly indented the base center. 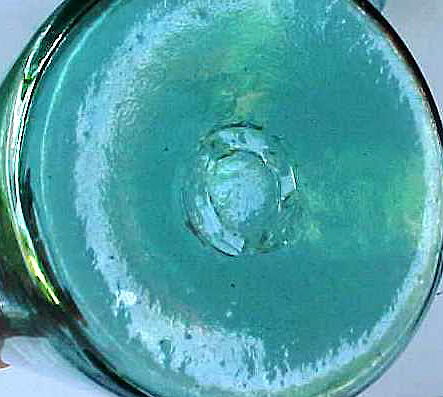 This image also shows about as well as can be photographed the scattering of tiny, imbedded, rough sand/glass fragments forming a more or less circular or oval pattern on the base of an 1830s to 1840s era American-made medicine bottle. 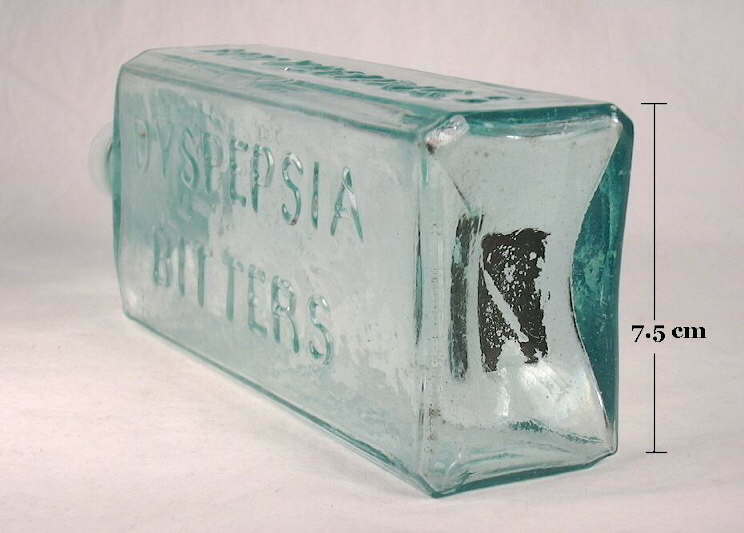 (This bottle is discussed on the Medicinal Bottles typology page.) The term sticky ball pontil is an alternative name for the sand pontil. It was apparently coined by collectors in the West in the late 1960s to describe the "sticky" feel to ones finger running over the area; the term is still used on occasion today (Wilson & Wilson 1969; Wichmann 1999). The term "sand pontil" or "sand chip pontil" are currently much more widely accepted terms by both collectors and archaeologists. This type of pontil can be very subtle and difficult to properly identify; it is also difficult to properly photograph. The author has frequently noted that a rough or pitted surface to the base of some bottles is often mistaken for a sand pontil scar, sometimes misinterpreting the illustrations from this website in making a determination. Specifically, these misinterpreted bases have a smooth roughness to the glass surface induced by the cast iron used to form the base plate of the mold, a mold portion which was not always machined to as smooth of a working surface as the two upper mold halves were. 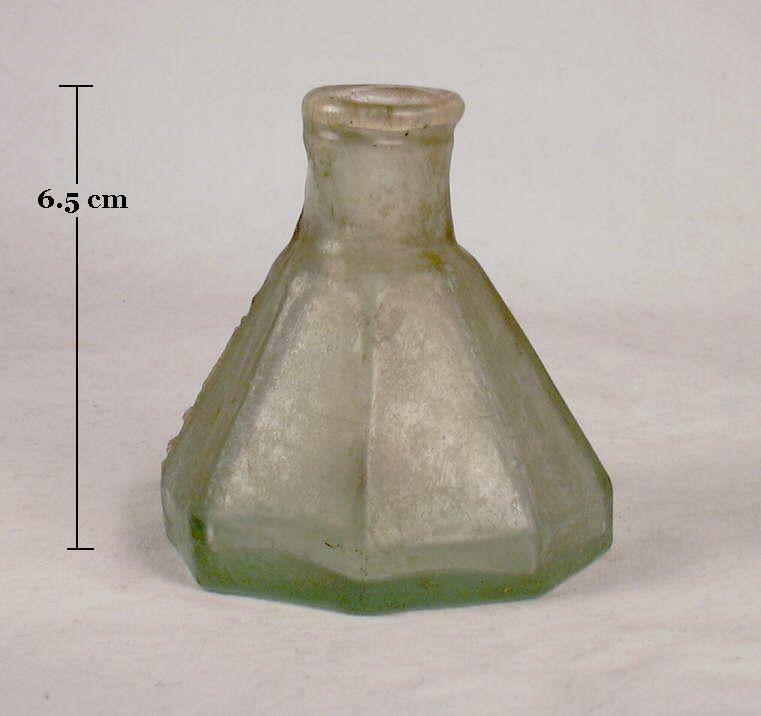 The bottle base at this link - mid-19th century American-made handled liquor bottle - shows a rough surface to the base of the bottle which is not a sand pontil scar, but instead just mold induced roughness which makes for a visually rough glass surface but is otherwise smooth to the touch (photo from eBay®, the listing of which was noted as a sand pontil). A true, but lightly showing, sand pontil scar often must be confirmed by running ones finger over the base and feeling for the presence of a finger grabbing "sandpaper effect" or "catchier" roughness to the base glass surface that is not smooth feeling. A true sand pontil feels and visually appears to be a generally round or oval area with a sparse scattering of very fine but angular sand, glass, or quartz grains imbedded onto and into the surface glass of the base. Some have described this as an "orange peel" effect (McDougall 1990), though such a description may be part of the confusion, as a true sand pontil is not bumpy smooth like an orange peel is. 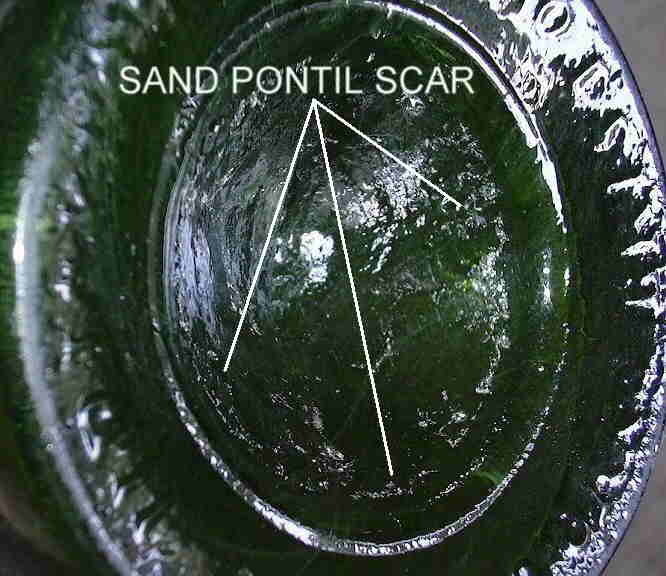 The sand pontil is not only common on English green glass "wine" bottles made during the mid-17th to first quarter of the 19th century, but is so characteristic that the presence of another type pontil mark makes a bottle likely to be of non-English heritage (Jones 1986). The English sand pontiled wine or liquor bottle pictured to the right below was produced in a Rickett's patent mold and is specifically dated 1822 on an applied blob seal. The Rickett's patent mold (patented 1821) was at least a moderately revolutionary advance in bottle making efficiency of that time due to the mechanical nature of the mold which allowed the gaffer to open and close the mold with a foot pedal. It also was likely the first plate mold - via a removable "washer" type ring around the center mold post plate - that allowed for the easy changing of the base embossing. The Ricketts mold was adapted in the the U.S. at least by early 1830s (Jones 1983). 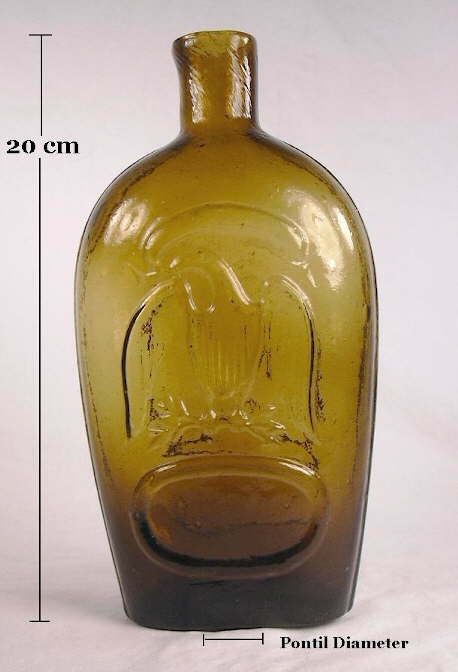 Click HERE to view a picture of the 1822 dated Rickett's mold bottle. Sand pontils are also frequently seen on black glass wine, champagne and/or spirits bottles made into the 1860s. 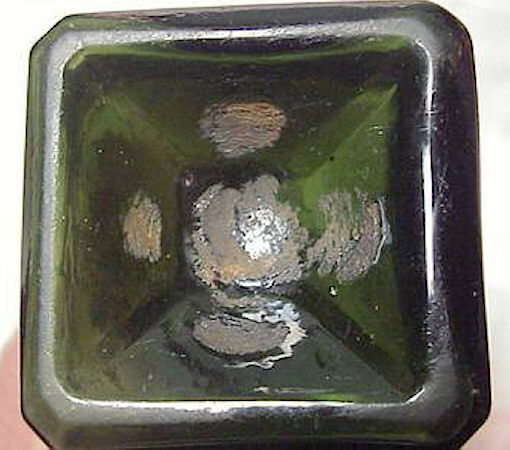 Click black glass spirits bottle to view a picture of a larger dip molded example that has a sand pontil scar and likely dates from the late 1850s to 1860s period - the later end of the sand pontil era. Click sand pontil base to view a picture of the base of this same spirits bottle showing the sand pontil scar. 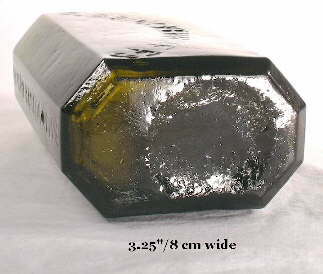 This example also exhibits the bluish cast to the glass in the middle of the base that is often observed on sand pontiled (and sometimes non-pontiled) black glass ale/spirits bottles with push-up bases (McDougall 1990). The bluish cast on non-pontiled bottles is likely the result of the use of a separate rod to form the push-up (not the snap tool used to hold the bottle for finishing). And finally, many/most of the champagne bottles found on the S. S. Bertrand, which sank in the Missouri River in April 1865, were sand pontiled (Switzer 1974; personal observations of a portion of the collection by this website author October 2015) although that would be considered about the end of the sand pontil period. This fascinating type of pontil mark is also referred to as simply an iron pontil or improved pontil. It is also commonly referred to as a graphite pontil. This is erroneous as there is no graphite (carbon) associated with any improved or iron pontil mark. Apparently the term originated from the fact that the substance often looks like a graphite smear. In actuality, the residual red, reddish black, gray, or black deposits are iron, typically oxidized iron - ferric (red) and ferrous (gray, black) oxides (Toulouse 1968; McKearin & Wilson 1978). One particularly erroneous interpretation of the iron pontil was that it was the residue left behind "...when the pontil scar (was) erased by an iron ball dipped in oxide." (Wilson & Wilson 1969). 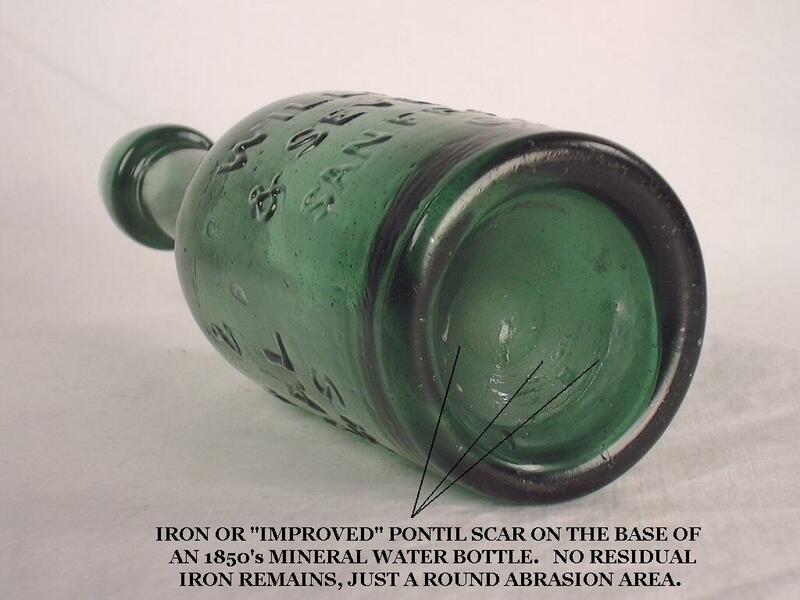 The iron pontil scar is the result of using a bare iron pontil rod with an appropriate shaped tip or head which was heated red hot and directly applied and fused to the base of the bottle to be held. There was no glass added (like the glass-tipped pontil rod) or remaining (like using the blowpipe for a pontil) on the iron tip of this type pontil rod. 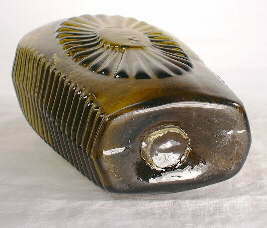 Click HERE to view an illustration of a bare iron pontil attached to a bottle base. Like the other pontil rod types, this one was probably removed by sharply tapping the rod near the attachment point. The iron deposits which form the iron pontil mark are very small fragments or residue from the tip of the bare iron pontil rod itself. Evidence that the tip of the iron rod was patterned is sometimes seen in the mark left behind, like the hatch markings shown in the iron pontil mark pictured to the left on an 1850-1860 calabash bottle. Other iron pontil scars can show evidence of a rod with a four quadrant head, i.e. a quatrefoil, and many other shapes (Jones 1986). 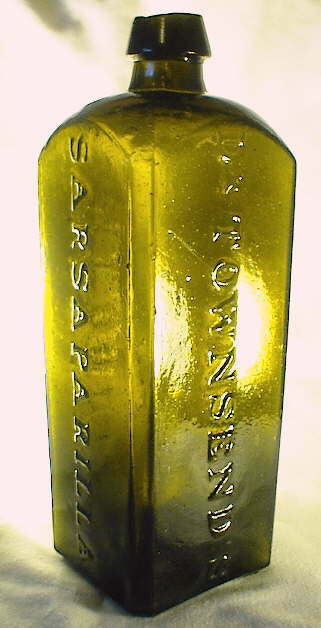 (Click Dr. Townsend's Sarsaparilla base to view the base of a ca. 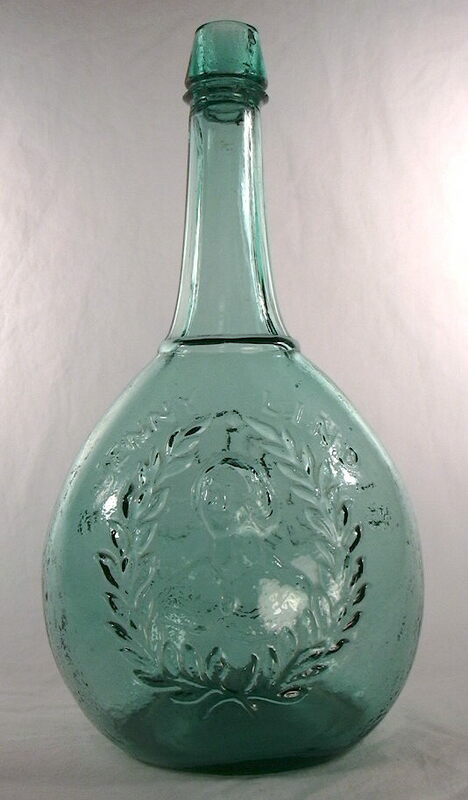 1845-1855 era large New York medicinal bottle with a quatrefoil type iron pontil scar.) These type rods were also used to form the push-up in the base of some bottles. 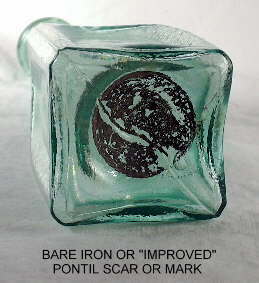 The typical round iron pontil mark or scar pictured above right is on a common pepper sauce bottle that dates from the 1850s or early 1860s. 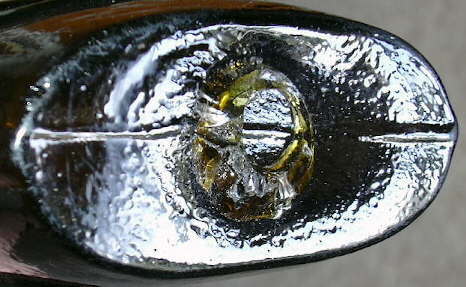 The residual iron is very distinct and the outline of where the bare iron pontil tip fused obvious. Click HERE to see a picture of the entire bottle which were referred to in glass maker catalogs as a "gothic pepper sauce" due to the ornate panels on the sides of the bottle (Whitall Tatum & Co. 1880). This general style of bottle is still referred to as a gothic or "cathedral" pepper sauce by collectors and archaeologists (Switzer 1974). This particular bottle shows distinct twisting distortion to the base mold seam which was likely a result of a twisting motion to the iron pontil tip as it was pushed and fused into the base of the bottle by the gaffers assistant. 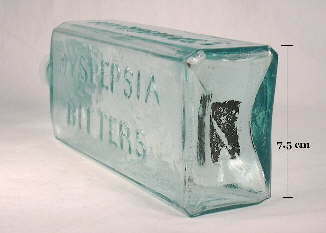 The unusual rectangular iron pontil scar to the left is on a Hutchings Dyspepsia Bitters (New York) which dates between 1850 and 1856 (possibly 1857), when the company apparently dissolved and the product ceased being advertised (Odell 2000; Ring & Ham 2004). The Hutchings Bitters are also found with blowpipe pontil scars but not with smooth bases, i.e. without a pontil scar (Ring & Ham 2004). However, the vast majority of the time (95%+) iron pontil rods were round and left round scars. Click Hutchings Bitters to view a picture of this entire bottle. Another unusual iron pontil is pictured to the left above and was formed with an iron pontil rod that had cross-hatching cast into the head. This is an amber calabash flask from about 1860. The bottle pictured to the left is a California Gold Rush era soda & mineral water bottle (Williams & Severance) from San Francisco, CA. that dates between 1852 and 1854 (Markota 1994). 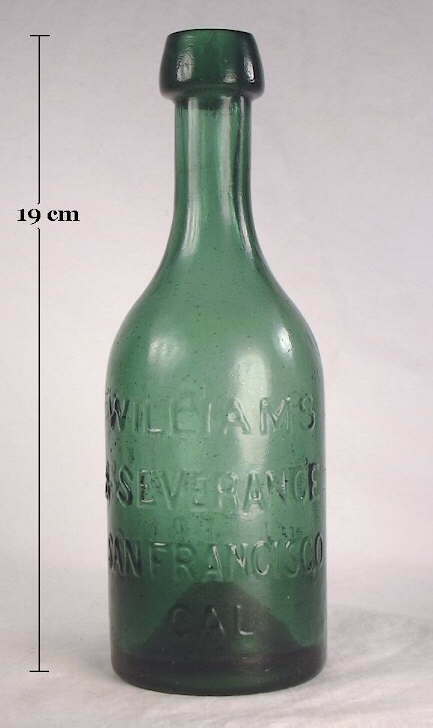 As there were no glass manufacturing facilities in the West prior to 1859, bottles were blown at a glassworks on the east coast and transported around the horn by sailing ship to San Francisco (Toulouse 1971; Hinson 1995). This bottle has a very faint iron pontil with very little residual iron remaining. This is a common occurrence on iron pontiled bottles and is a result of simply little residue left by the iron pontil rod, weathering of the bottle after manufacture, and/or recent mechanical cleaning. Click the picture to view a larger version where the details of the pontil mark are more evident. This bottle still exhibits the ringed or round surface abrasion markings of where the iron pontil tip was fused to the base. The subtle markings have a "matte" or "frosted" appearance which is distinctive from the otherwise smooth and glossy glass surface of the base. 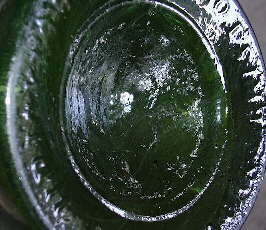 This base also shows some of related "ridging" (right side of pontil mark) that was caused by the intense heat of the iron pontil rod acting upon and distorting the surface of the bottle base. Click Williams & Severance to view a picture of this entire bottle. 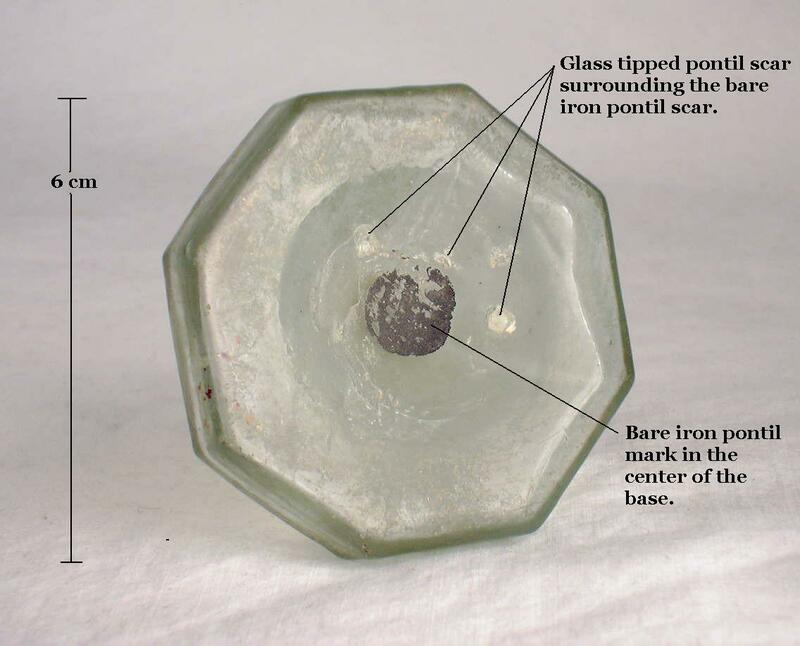 Iron pontil marks are extremely common on mid-19th century (1845-1865) "blob-top" soda/mineral water bottles such as the pictured example, almost to the exclusion of all other types of pontil marks (McKearin & Wilson 1978). Occasionally found are bottles which appear to have two types of pontil scars on the base. For lack of any previously defined term, it is being called here a "combination" pontil scar. Only a small minority of pontil scarred bottles have "combination" pontil scars. The bottle pictured to the left has an obvious bare iron pontil mark surrounded by a distinct glass tipped pontil scar (click on picture to enlarge for detail). The reasons for this phenomena are unknown since the bottle only needed to be held by one rod for finishing. The most likely answer is that the center of the glass tipped pontil rod fused to the hot base of the bottle leaving behind the iron oxide typical of a iron pontil scar along with scattered fragments of glass typical of a glass tipped pontil scar. The pictured bottle is what is known as an "umbrella ink" and was a very common style from the 1830s up until the late 19th century, though most commonly used between about 1850 and the 1880s. This style was almost exclusively used for ink, though may have been used on occasion for mucilage (glue). Click umbrella ink to view a picture of the entire bottle. The pictured example dates from the early 1860s based on where it was found - Virginia City, Nevada - which did not really exist prior to 1859 (Lyman 1934). The yellow green barber bottle base pictured to the left (and earlier on this page) is another example of a combination pontil, though it is primarily a blowpipe pontil scar with some residual iron from the pontil rod remaining on the bottle. As such it would more accurately be called simply a blowpipe pontil scar. 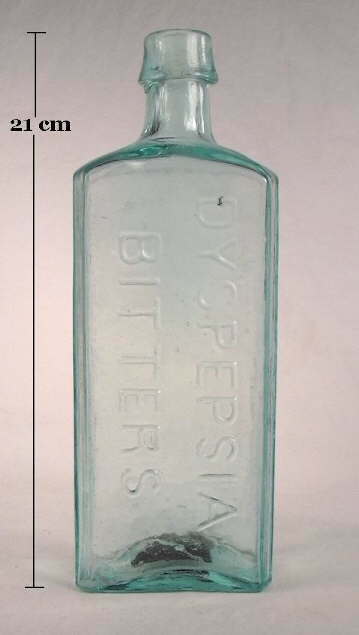 This is one of the "specialty" bottle type exceptions that were discussed earlier as it dates from the late 19th to early 20th century though has a pontil scar like a bottle produced many decades earlier. One other type of combination pontil scar is the double glass tipped and/or blowpipe pontil. 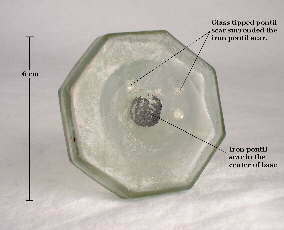 Click Bininger barrel base for a picture of a 1850s liquor bottle base that exhibits a distinct blowpipe pontil scar in the middle of the base surrounded by a distinctly separate and larger round (glass tipped?) pontil scar. A likely reason for this is that the first pontil attachment (blowpipe) failed and a second, different sized pontil rod was utilized in finishing the bottle. 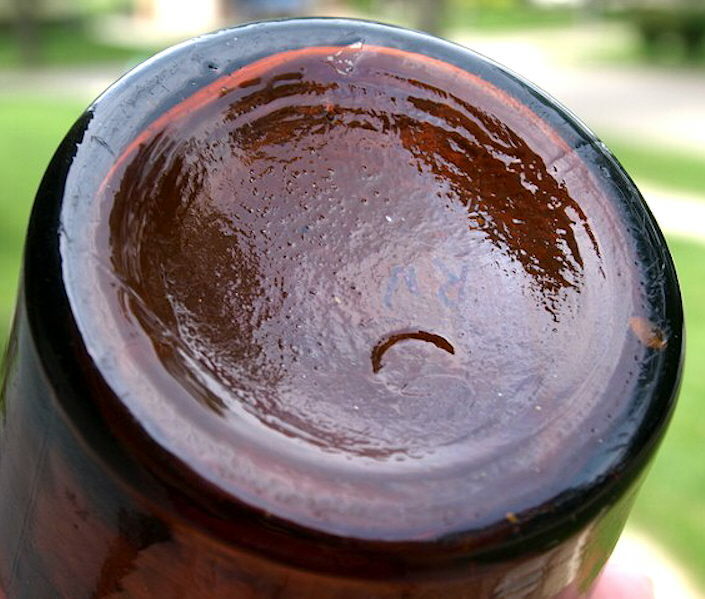 Conceivably, this type of pontil scar could be the result of some type of pontil rod with two circular ridges which attached to the base of the bottle. 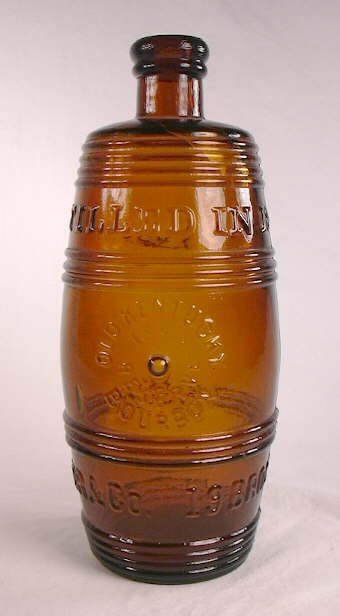 The pictured base is on a relatively common "barrel" shaped A. M. Bininger Old Kentucky Bourbon bottle (New York); click Bininger barrel for a picture of the entire bottle. 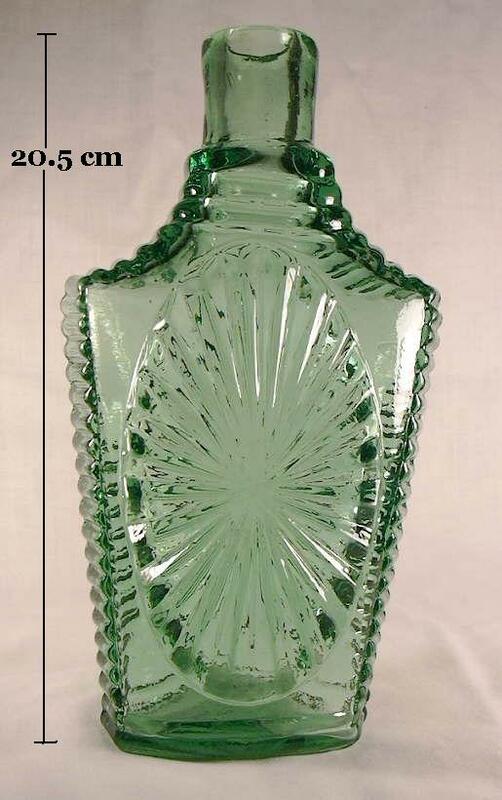 Fancier bottles like this were quite expensive to produce during the mid-19th century and the discarding of one that could be salvaged was likely avoided if possible; thus the use of the extra time to "re-pontil" the bottle (Wilson & Wilson 1968). Glass tipped, blowpipe, and sand pontil marks may all be found on most all bottles dating well before the period covered by this website, i.e. before the early 19th century, and continued to be common on a large majority of bottles up until the American Civil War. During the Civil War, the pontil rod was gradually but largely phased out, though some utilitarian bottles (a relatively small percentage) were still being produced with these pontil marks as late as the early 1870s. After that time, those types of pontil scars are very unusual and related mostly to the production of low volume "specialty" bottles (e.g., fancy liquor decanters, barber bottles). The bare iron pontil apparently had a fairly narrow lifespan as the majority of these bottles date between about 1845 and the mid-1860s, though they can be as early as 1830s and possibly as late as about 1870. They are particularly common on mid-19th century soda/mineral water bottles (Toulouse 1968; Watson & Skrill 1971; McKearin & Wilson 1978; Cannon 1990; Boow 1991; Van den Bossche 2001). The rare occurrence of combination pontil scarred bottles is not conductive to any useful dating observations, though the dating would follow the time lines noted here for pontil scars in general. Pontil scars are most often observed on true two-piece and post-bottom mold produced bottles; they are unusual on bottles produced in cup-bottom molds though encountered now and then, especially on "specialty" bottles. They are very unusual on turn-mold bottles with the exception that they are frequently seen on turn-mold barber bottles from the late 19th and even early 20th century (like pictured above) and occasional shop furniture bottles made during the last half of the 19th century. Click this link - shop furniture discussion on the Medicine Bottle typology page - for more information.